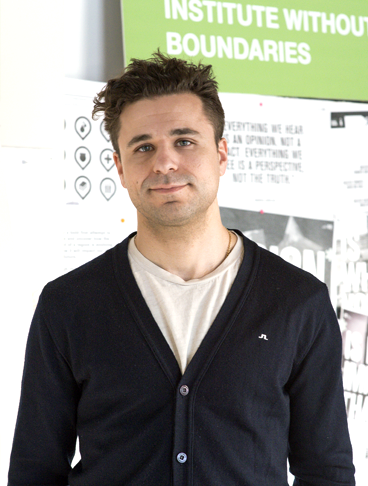 Christopher Pandolfi is a designer, educator, and principal of the Toronto-based research and design studio Department of Unusual Certainties (DoUC). Before forming DoUC in 2010, Christopher worked as an urban designer and researcher in Italy, Korea, Rotterdam and Toronto on a number of different local and international projects, publications, and exhibitions. With DoUC, Christopher exhibits and publishes around the world. From February 2011 – May 2012, DoUC was the Innovator in Residence at the Design Exchange, Canada’s national design museum. DoUC was also a strategic partner for the Migrating Landscape Organizer, Canada’s entry for the 2012 Venice Biennale of Architecture, producing work for nine different exhibitions including the Canadian Pavilion in Venice. Christopher is the Academic Coordinator at the Institute without Boundaries at George Brown College. He holds a bachelor of Urban and Regional Planning from Ryerson University and an MA from Domus Academy (Milano, IT) in Urban Management and Architectural Design.